I have had the unpleasant experience of being a victim of identity theft. About 6 years ago, I had $500 stolen from my bank account. When I discovered the money was gone, I called my bank immediately. I lived in Ontario at the time and was nowhere near Montreal where the money was withdrawn. The bank gave me my money back, but since that experience, I’ve always been nervous about identity theft and fraud. This experience really shocked me into reality and made me realize that I need to be more careful when it comes to using my debit card at stores (especially gas stations where I believe my fraud took place). One thing that I have wanted to buy for a long time has been a shredder. Whenever I had to dispose of old credit cards or other important documents, I would cut them up by hand. A shredder could do the job much faster and more efficiently than I ever could! 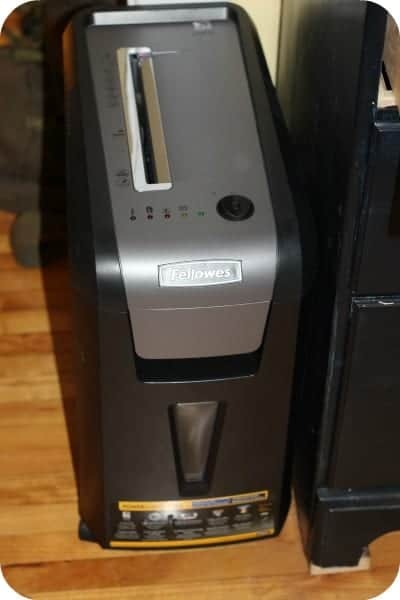 I’m now the proud owner of a Fellowes Powershred 69Cb. I used to work in an office environment so I’m familiar with the Fellowes brand of office products. The Powershred 69Cb provides high performance shredding and has many features that I have come to appreciate. SilentShred: It’s super quiet! You can shred anytime of day and not worry about bothering anyone or waking up a napping child. I remember how loud our shredder was at the accounting office where I worked so this feature is a HUGE plus! JamBlocker: This key feature blocks paper jams before they happen. It was so annoying to deal with shredder jams and they seemed to happen to me almost every time I would shred at my old job. With the Powershred 69Cb, the shredder will automatically reverse the paper so you can easily remove it and prevents a jam. 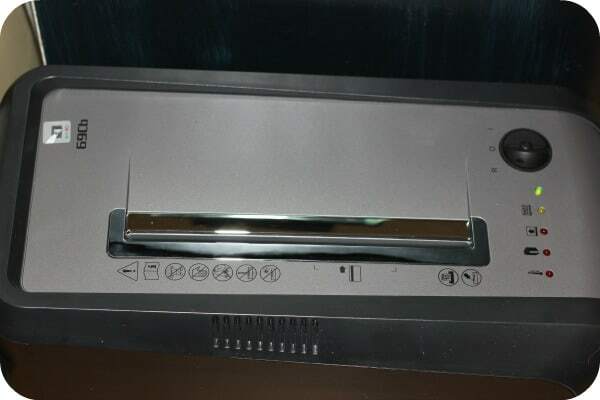 If you put too much paper in, the Remove Paper icon will light up and then you remove some paper and re-feed it in the shredder. SafeSense Technology: Stops shredding when hands touch the paper opening. As a mom, I’m always worried about the safety of my children. Although I wouldn’t let my kids play with the shredder, I feel better knowing that the shredder is equipped with this patented safety sensor to prevent an accident from happening. The Fellowes Powershred 69Cb uses powerful solid steel cutters with a cross-cut capability. It shreds paper, credit cards, staples and even small paper clips. It can take 10 sheets of paper per pass and shreds your documents so no one will be able to get any key info of them. The pull-out bin holds 5 gallons which is a good size for home use. The recommended daily use is 300 sheets/10 credit cards. I’ve got a huge pile of paperwork in the office that I need to shred. It’s mostly old bills and I’ve been hanging onto to them until I got a shredder. Now I can finally clear that space and dispose of them properly and safely! I do not want to be victimized again so will do everything in my power to educate myself and take the proper and necessary precautions. In terms of design, its sleek and black and blends in perfectly next to our black desk in the den. It’s an excellent addition to our home office space with so many benefits! Sylvain Patry, senior vice-president at ProtectionPower.ca, is an identity theft expert and he has compiled a list of the top 10 documents that you should be shredding. This list was a big eye-opener because in the past I’ve just thrown away or even recycled some of these types of documents. It’s scary to think that I could have been putting myself at risk for identity theft. I definitely will be shredding all these types of documents from now on! 2. Employment Paystubs – If you receive pay stubs on a weekly basis or otherwise, you should keep them only until you receive your annual wage and tax statement. 3. Personal Income Tax Reports – You should hold onto these (in a safe place) for five years. However, after five years, it is important that they be shredded. 4. Monthly Utility Bills – This includes anything from hydro bills to cable bills. 5. Spam Mail – Any document you receive by regular mail, including sign-up forms for a new credit card, a magazine subscription, or any other document that contains your personal information, such as your name, home address, phone number, etc. 6. Federal, Provincial or Municipal Government Documents – Examples of this would be your health card, driver’s licence or passport renewal notices, or even a confirmation letter of your children’s school registration for the new school year. 7. Express Mail Documents – Generally invoices or a confirmation of delivery that accompany a letter or package that was delivered to you by UPS, FedEx, or Canada Post Express – even the labels on delivery boxes or envelopes. 8. Membership Notices – If you are a member of any organization, such as a tennis club, fitness club, library, etc., be sure to shred all membership renewal notices and documents accompanying the delivery of membership cards, credit cards, store cards, etc. 10. Miscellaneous Documents – Any other documents you receive or possess that contain usernames and passwords. I definitely did not realize the risk associated with Express Mail Documents. As a blogger, I receive many deliveries and never thought twice about recycling the paperwork that comes with my shipments. I will be using my Fellowes Powershred 69Cb for any kind of paperwork that contains any kind of personal information. 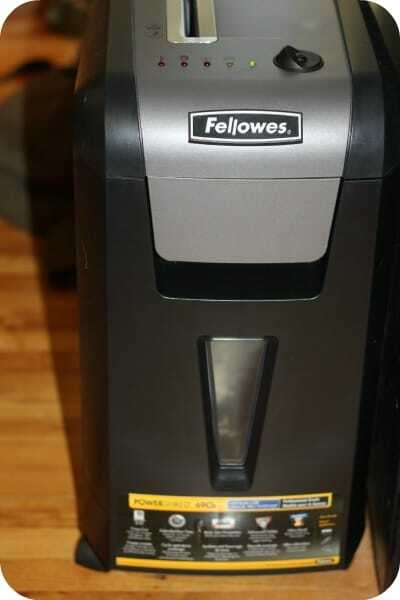 If you are concerned about identity theft and want a good quality shredder that does the job and is safe, then I encourage you to check out the selection of shredders at Fellowes including the Powershred 69Cb that I reviewed. You can pick one up for yourself at a Staples near you. Connect with Fellowes Canada on Twitter. Disclosure: I received a sample of the product for review purposes. The opinions are my own, based on my personal experience with the product. Looks amazing. I am in dire need of a new shredder. THANK YOU FOR THIS INFO I TOO DID NOT THINK OF EXPRESS OR SOME OF THE OTHER THINGS MENTIONED! 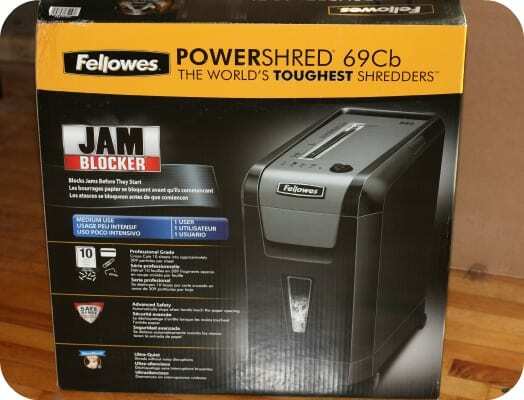 Yes identity theft seems to be on the rise, this Fellowes Powershred 69Cb would be a great thing to have available. ty for this. Sounds like a great shredder. Currently shredding past year no longer needed at work. Wish I had this one! I really like that this has a sensor to protect curious little hands! I’ve been thinking about getting a shredder for home use due to the mountain of (mostly junk!) mail with personal info, so it’s nice to see all the features laid out like this. Identity theft is certainly a scary possibility for anyone! Ashredder is almost a must-have these days. This one sounds like a great shredder. I like that it is quiet and stops shredding if hands touch the paper opening. We have had a shredder for the last 10 years or so. When you read about people going through your garbage just to get info about you, it makes you think. We haven’t had our identities stolen but have dealt with some phone scams regarding my dad and his computer. Once you have had to clean up one of those messes, you certainly want to keep all your info safe. I like that this one has jam-blocker because I always seem to jam ours up. This one looks much better than the one we currently have. I love the fact that it is super quiet. I had one in the past that was super loud and annoying. this would be a good idea to have. i am always worried that someone will get information from paperwork! My shredder is dead, and this looks like a great one! I’m sorry to hear about your identity theft. I have been considering a shredder for awhile but wasn’t sure what to buy. I know I want something that doesn’t jam, cross cuts, and is decently quick. It sounds like you have a good one. Thanks for he list on what to shred. I could use this. I have a shredder but it is so loud! My sister has one of these and they are awesome!! Thanks for the great review, and all the info from someone I trust and value their opinion! I’ve needed a shredder for a long time. This one looks great. guess I should replace my existing system (ripping into shreds and flushing down the toilet). Probably not the safest for the environment. I shred everything that needs to be shredded because their are too many crooks out there trying to steal anyone’s identity! A person can not just throw their important documents out without shredding them! This is a really nice shredder! When I need a new shredder I am considering buying this model! thank you for this i was just out yesterday looking at shredders for my mom. She has one on her Christmas list and there were so many i had no idea what functions to even look for! I really like that this does credit cards, its quiet and its safe! This looks like a great shredder. I love that it works with 10 pages, staples & even small paperclips, credit cards. I know some will even do CD’s which would be great if you store important backups on them of financial info like tax returns, etc. A shredder is an essential tool in any household… my opnion anyways, so I really appreciate your review. Fellows is a great brand. 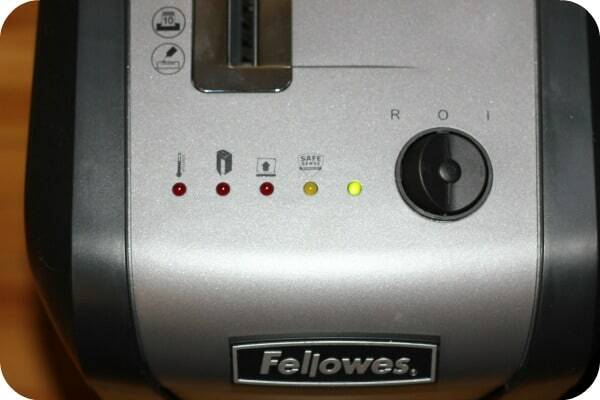 I have an old Fellows shredder that I have put through the paces over the last decade and its still going, but I do need to shop around for a new one soon. Definitely will try to find the one you reviewed. Thanks! We really need to invest in a shredder. At the moment we burn important trash 🙂 Thanks for the great review! There’s also some good YouTube videos out there of this shredder in action….helps to actually see it shredding paper. 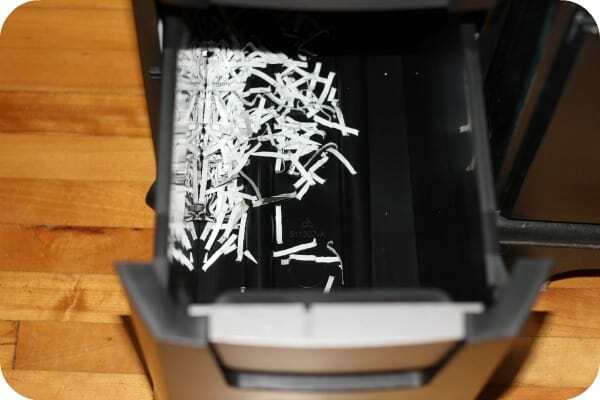 I think shredders are so important to have around the house.. You should always shred up those important documents containing personal information. This one though, I also love that it reverses paper direction before a jam can occur.. I seem to always have that happen to me as well!! !